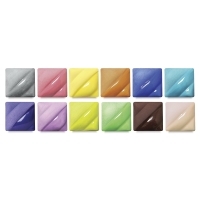 These blendable colors may be brushed on greenware which is to be bisque fired before applying a covering glaze or on mature fired bisque, then a covering glaze applied. 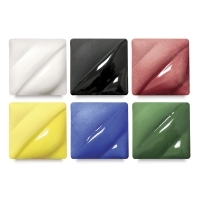 All colors are opaque.All colors are sprayable and dinnerware safe when applied and fired under Amaco LG-10 clear glaze. Set of 6 — Includes six 16 oz jars, one each of Black, White, Medium Blue, Dark Red, Dark Green, and Bright Yellow. 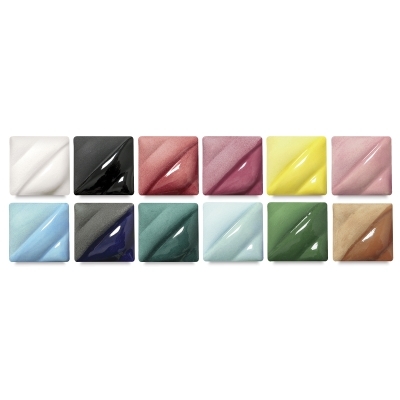 Set of 12 — Includes twelve 16 oz jars, one each of Black, White, Light Blue, Dark Blue, Aqua, Light Brown, Blue Green, Dark Green, Rose, Peach, Dark Red, and Light Yellow. Set No. 712 — Includes twelve 2 oz jars, one each of Black, White, Light Blue, Dark Blue, Aqua, Light Brown, Blue Green, Dark Green, Rose, Peach, Dark Red, and Light Yellow. Set No. 812 — Includes twelve 2 oz jars, one each of Warm Gray, Medium Blue, Turquoise, Mahogany Brown, Chartreuse, Warm Green, Pink, Sun Tan, Lilac, Purple, Bright Yellow, and Orange.